The eldest brother in the Ninja pack, his first job at MGM was at the tender age of 14 working on Saturdays, sweeping floors and cleaning toilets. He decided to go to college after Dad’s “opportunity” wore off and graduated from Vanderbilt University in 1980, with a degree in mechanical engineering. Upon graduation, he worked as a field engineer for a natural gas pipeline company and then as a design engineer in the marine industry, before earning his MBA with a concentration in marketing at the University of Tennessee in 1985. That’s when his dad offered him another opportunity at MGM and he’s been here ever since. 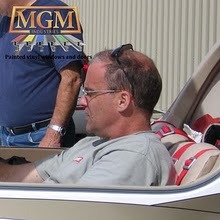 As an engineer, Abe oversees MGM’s extrusion operation and is the principle designer for MGM’s windows. He keeps his pulse on future products that will address customer needs and market trends. And when he’s not focused on the future, he’s spending his time putting his private pilot’s license to practice, flying over the Tennessee countryside. I am looking for a white PVC paint that can be used on our product. I am looking for something brush on in gallon quantities. We have the trouble of having to match the color of the PVC on our duct work. Do you know of a supplier with a PVC paint product that will not “fall off”. We are now selling paint for PVC if you want to consider that option. I’ll follow up with an email to you off the blog.